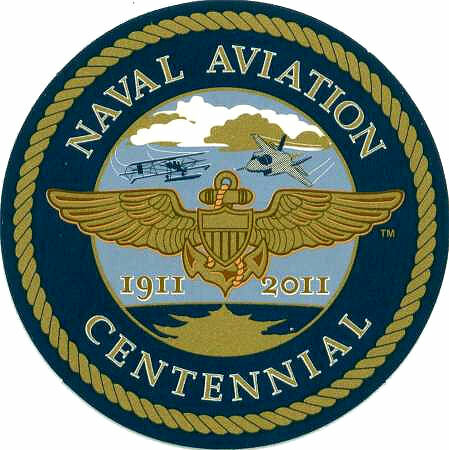 Twobobs Aviation Graphics continues to release decals to celebrate the special paint schemes that the US Navy is using to celebrate the 100th Anniversary of Flight (Centennial of Naval Aviation or CONA). Each decal sheet contains markings for these special aircraft, and a 3" sticker with the CONA official logo is included in the packaging. 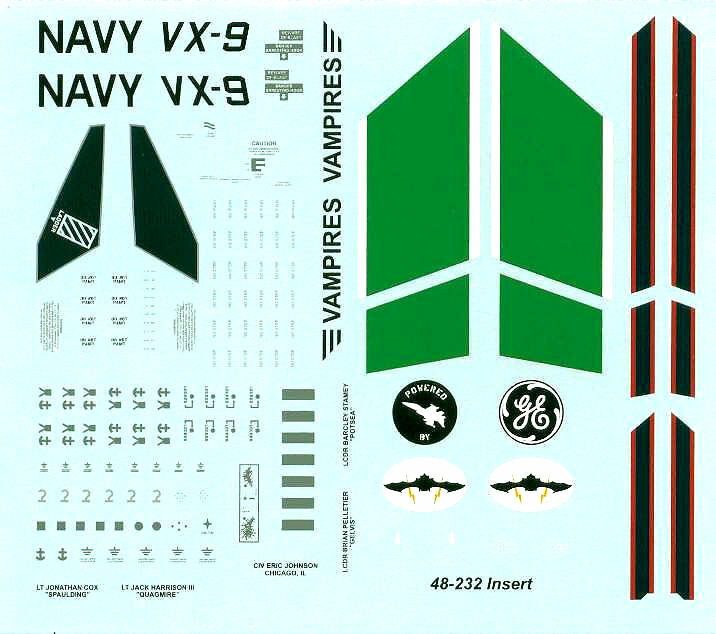 Twobobs actually has an official licensing agreement with the Navy to bring these decals to us in the hobby world! As always, this Twobobs release features decals that are thin, crisp, and in perfect register. Packaging is the usual clear zipper bag we see decals in, and inside is a one page, double sided, full color sheet which contains color information, the decal placement directions, and some images of the actual aircraft. This package contains one "standard size" decal sheet as well as a smaller insert sheet, along with the 3" sticker mentioned earlier. Decals are printed by Microscale Industries for Twobobs. 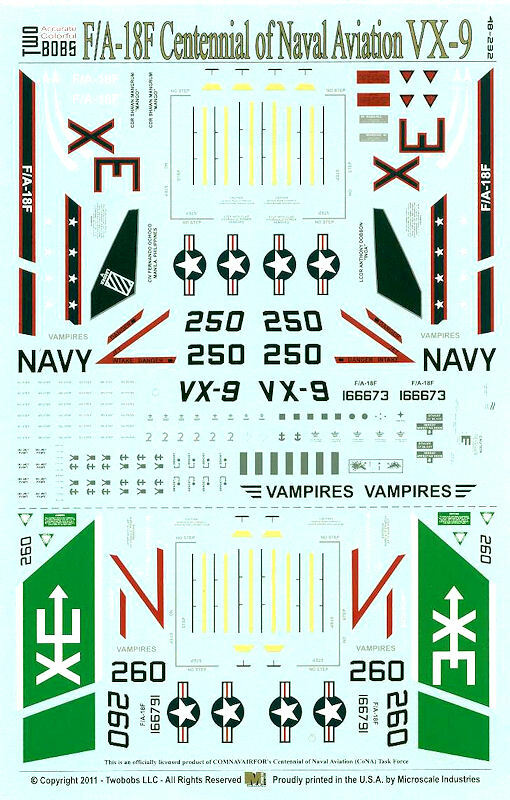 This decal sheet covers two F/A-18F Super Hornets from VX-9 "Vampires" (NAS China Lake) as seen in February 2011. Both aircraft have the standard overall scheme of FS36320 with flashy individual tail markings (dubbed "Easter Egg" schemes by some). Each aircraft features individual markings as well as a full set of stencils - yes, you CAN build two aircraft from this decal sheet! The first aircraft is an F/A-18F Super Hornet BuNo 166673. This aircraft features a black tail with dark blue and red stripes with the "XE" also in red/dark blue. Decals are provided for all of the dark blue/red markings, and the modeler needs to paint the tail black. The second aircraft covered in this decal sheet is an F/A-18F Super Hornet BuNo 166791. This aircraft has white rudders and a green stripe on the tail, bordered in white. The "XE" is also in white. Decals are included for the green & white striping, and the modeler needs to paint the rudder white. As I mentioned before, you get enough decals on this sheet to do two aircraft with full stenciling. Both aircraft feature the retro style red white and blue "starts n bars". If you're interested in adding some colorful Super Hornets to your display case, look no further. I highly recommend this and the other CONA sheets to anyone wishing to celebrate the CONA, or just looking to add something a little different to their collection. Thank you again to Twobobs for this review sample and for bringing these very special CONA sheets to the modeling world!